The 2018 film was released again in 2019, for Easter? Reviews are not kind. The consensus: it's boring. It's a revisionist movie with a feminist Mary. It doesn't sound exciting. It seems in these modern days that people who don't believe in God or Jesus are the ones who keep making these biblical films. See Ridley Scott's EXODUS (2014). The distribution of this film was chaotic, to say the least. It was pushed back from a late 2017 release. The Western Company was to be its distributor but we know what happened with the whole Weinstein saga. The film was shown in different parts of the world but only got a new distributor for this year's release. 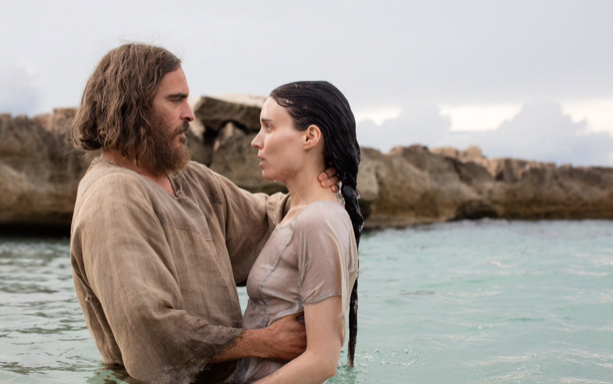 Joaquin Phoenix, as Jesus, and Rooney Mara as Mary Magdalene. The religious genre seems to be dead, except for a small niche audience. Mel Gibson's THE PASSION OF THE CHRIST (2004) was the last religious movie to get much attention. It was heavily criticized for its ultra-violence and anti-Semitic themes. The relative box office failure of AGORA (2009), however, shows the risks of making a film with an anti-Christian theme for the American market. This movie did better in Europe than in the USA. I recently watched the recent SAMSON. What a terrible movie! Most of the new crop are all but unwatchable.